TOEFL is used to evaluate the English proficiency of individuals whose native language is not English. Most U.S. schools understand that Singaporeans are taught English, and will waive the test. You should check with the schools you are applying to and verify their requirements. If you have studied in Singapore but are not a Singapore passport holder (e.g. from Vietnam), you will probably have to take TOEFL. We strongly encourage you to double check with each school to make sure you are fully prepared for admissions. Over 3,000 institutions and programs in the United States accept IELTS scores as proof of English language skills. Since admission requirements may differ from school to school, once again we strongly advise you to check with the university you are applying to if you need to complete this test. Go to www.ielts.org for registration information. Many, but not all, universities require freshman applicants to take the SAT®: paper-and-pencil tests that evaluate students’ proficiency in English, writing and math. Check each school’s requirements before you register for this test. Only about 3% of U.S. universities may require students to take SAT Subject Tests® for admission purposes. You can go to www.collegeboard.com to register on-line. The ACT test is the only university entrance exam accepted by ALL U.S. universities. The ACT tests you on what you have learned in school, not aptitude. The ACT Plus Writing exam includes four multiple choice tests in English, mathematics, reading, and science PLUS a 30 minute writing test. The SSAT is a standardized test used by admissions officers to assess the abilities of students seeking to enroll in an independent school. The SSAT measures basic verbal, math and reading skills students need for successful performance in independent schools. Middle Level and Upper Level tests are available in Singapore. Elementary Level and Flex Tests are NOT available in Singapore. This computer-based exam measures general critical thinking, analytical writing, verbal reasoning, and quantitative reasoning skills. The GRE must be taken by students who wish to obtain a graduate (post-graduate/masters) degree. Students planning on pursuing post graduate degrees in engineering, math, sciences, social sciences and arts will most likely be required to submit their GRE results with admissions application materials. 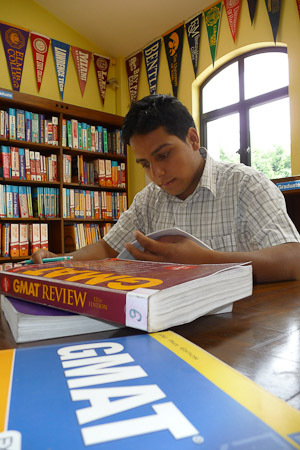 There is a GRE General Test as well as Subject Tests. Check with your desired university as to which one they require. (Students applying to law, medical or business schools will be required to take different exams). You can register for the GRE through its official web site: www.ets.org/gre. All students wishing to enroll in a business school to pursue a M.B.A. (not the B.A. in Business Administration) must take the computer based GMAT. This test assesses basic verbal, mathematical, and analytical writing skills that you should have developed up to this point through your education. Students who are seeking to enter any U.S. OR CANADIAN law school for the JD program will need to sit for the LSAT exam. LSAT exams are offered four times per year in Singapore. Advanced Placement Program®, AP®, SAT® and SAT Subject Test® are trademarks registered and/or owned by the College Board, which was not involved in the production of, and does not endorse, this site.